Posted 4/7/2019 9:15pm by John Clarke & Karen Hurtubise. Springtime!!! We are planting Turmeric and Ginger and Thai Tulips plus taters, tomato and pepper seeds, and lotsa flowers. And we are sending you a reminder of two QBF workshop events in Young Harris next week! It's time to sign up if you would like to learn about growing and using ginger and turmeric, plus enjoy a great Indian meal done by an amazing chef, Nanette Davidson! And we now have an easy registration form posted on the website! In other news, if you sign up with a spouse, friend, partner, or whatever, the second person is 10% off (so 2 people for $170 for April 14 and two for $124 for April 18). Someday soon we will be upscale and have a credit card button but not this day…checks still work! Please share this email with folks you think might enjoy this event…and thank you for being such wonderful supporters over the years. We are doing our best to spread the word for how to grow your own spices and food and these are our beginning workshops of 2019! 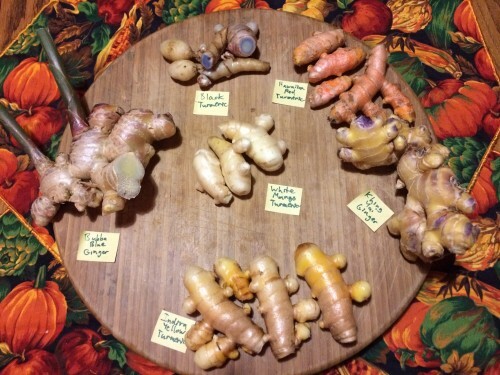 Fall harvest of baby ginger and turmeric. Start your spring gardening engines now! Come learn about spice and everything nice with turmeric and ginger! Over the centuries, these tropical perennial gems have been regularly grown as vital culinary and medicinal plants. Learn and experience hands on planting, propagation, seasonal cold protection, soils and spacing, irrigation strategies, bed and container growing, and harvesting. You will sample and learn to make teas, vinegars, refrigerated spice pastes, and candied ginger as well as knowing the best storage and freezing techniques and have a take-home plant of ginger and of turmeric plus some turmeric vinegar and candied ginger. This amazing spice plant family, Zingiberaceae, can become part of your everyday life and health in our Southern Appalachians, and we will show you how to do it. You will be glad to befriend and come to revere these historically significant spices into your garden and life. There will be an extra special demo of the black turmeric which cuts blue and is used in skin healing salves. Sunday April 14, 3:30-6:30pm: This class will be less hands-on as we will be treated at the end of the workshop to an amazing meal (see menu below!) featuring turmeric and ginger dishes prepared by Nanette Davidson. Total cost is $89 per person, register for two people and save at $170 for two! 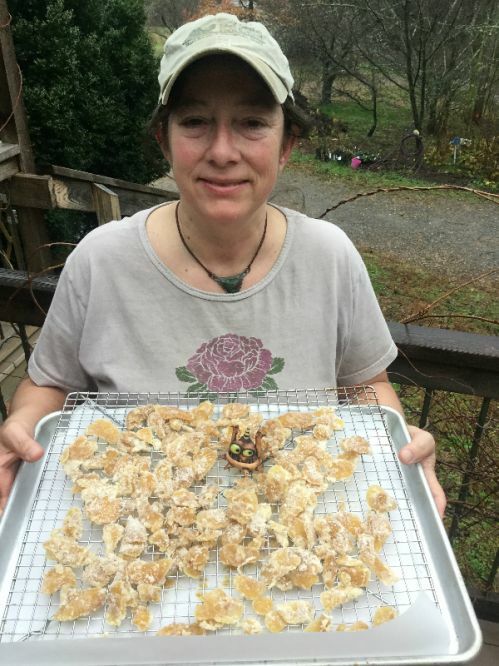 (non-refundable so we can plan quantities) Nanette’s Indian Feast Menu for the April 14 event features either ginger or turmeric or both and will be beautiful and yummy! Everything is gluten free except the somosas, naan, and shortbread. Everything is vegetarian except the chicken tikka. Everything is vegan except the chicken, paneer, raita and shortbread. We will have samples of Candied Ginger! Thursday April 18, 6-8pm: This class will be the same but a bit more messy and will involve more hands-on potting and planting so bring gardening clothes! Cost is $65 per person or $124 for two participants. We will be thrilled to have you come to Karen’s Young Harris office at 155 Murphy Street Highway 66 from 3:30-6:30 pm next Sunday April 14th or Thursday April 18th from 6:00 to 8:00 pm. We appreciate your support of our mission to spread the goodness of learning, growing, and using food and spices on the path to health and garden loveliness. Plants have a special language if you listen and learn about their unique gifts to us. In our experience, turmeric and ginger are here to help us tackle inflammation while enjoying the flavors of the earth. Help us let our tribe know how to add these crops and grow organic food and herbs, specifically turmeric and ginger…King and Queen of the Zingiberaceae plant family. More workshops in May at other venues…we will keep you posted!